This is a book which will gladden the heart of any gardener as we read of the vibrancy, enthusiasm, creativity and beauty of gardens worldwide. In the face of climate change, urbanisation, species loss, deforestation etc, garden creators around the world respond with positivity, a get up and go, a let’s do something about it attitude and that with energy and drive gardens and gardeners can show the world that there is much of great value in our natural world that we must strive to save and – this is the most important lesson to take from this book – that we can do it! Gibbs Farm, Makarau, North Island, New Zealand, a 990 acre garden featuring sculpture on the grand scale. Here: Marijke de Goey’s The Mermaid (1999), a sculpture of welded and painted tubular steel cubes bridging a lake. Christopher Woods spent twenty years as the director and chief designer of the famous and beautiful Chanticleer Gardens in Philadelphia and prior to that had spent time at Kew Gardens, Portmerion in Wales, Batemans in Essex, Cliveden in Berkshire and played a leading role at the Santa Barbara Gardens, the Van Heusen Botanical Gardens, the Mendocino Coast Botanical Gardens, Fairmount Park Conservancy and the American Public Gardens Association – he has been around gardens for a considerable while, let us say! This book, then, might well be described as a “busman’s holiday” as Christopher Woods tours the world and writes on fifty of the best gardens he has visited. 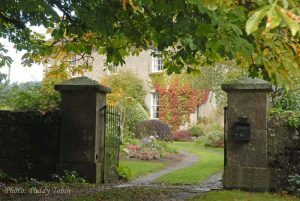 They are a personal selection, a selection of what he regards as beautiful gardens and all are 21st century gardens – all created within the last twenty years – though two are recreations or additions in older gardens. 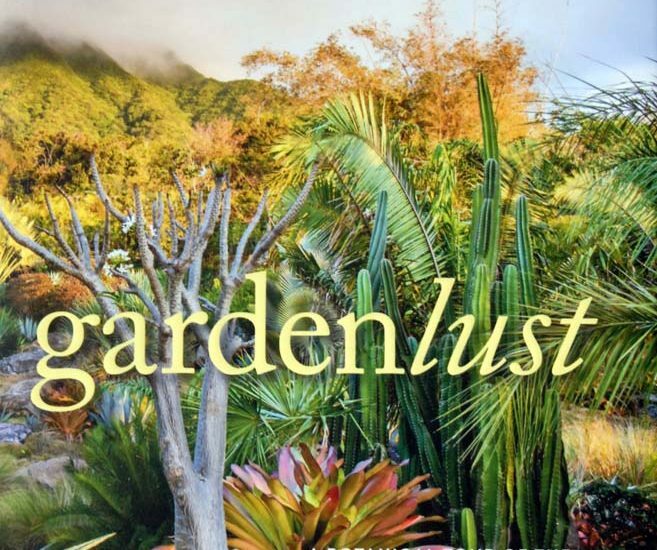 Along with the eternal desire to create beauty, to build our personal paradises, he sees modern gardens being more and more influenced by the desire to preserve rare plants and plant diversity, to address climate change, to plant in an ecologically appropriate manner, to accommodate native plants and to counteract urbanisation and deforestation. This book not only shows what can be done but will act as an encouragement to all gardeners to do likewise for the creation and enjoyment of beauty on our gardens is perfectly compatible with the care of our planet. Camel Quarry House, Cornwall, United Kingdom: The undulations of the stone wall echo the folds of the rolling Cornish hills in the distance – a design by Irish garden designer, Mary Reynolds. There are wonderful examples of which I would describe as “reclamation” gardening – the greening of previously industrial areas into areas which give pleasure, peace and beauty to the people living near them. The High Line in New York, the reclamation of an old railway line, will be well known, and there is a similar project in Barcelona, Jardins de la Rambla de Sants, and the Crossroads Station Roof Garden in London which features plants associated with foreign trade for Canary Wharf was once the busiest port in the world. Parc Clichy-Batignolles/Martin Luther King Park in Paris is now a 25 acres park where once there were warehouses, stockyards and freight yards while the 568-acre Landschaftspark, in Duisborg-Nord, Germany, reclaimed the former giant iron-smelting plant of the industrial Ruhr Valley, retaining remnants of its former use as a sort of repository of cultural memory. All are now fabulously beautiful and a testimony to the ingenuity of today’s garden designers and the current desire to make our world more beautiful and a better place for people. There are wonderful examples of conservation – the 321-acre garden at Al Barari in Dubai which has 34 gardens, 16 kilometres of landscaped streams and lakes, 4 million plants in an area which has temperatures of 40C and all water comes from the recycled water of a sewage treatment plant – no fresh water is used! The Oman Botanical Garden, extending to 1,045 acres, devotes 85% of its area to a nature reserve! Parque Explorador Quilapilun in Colina, Chile, has over 900 acres devoted to the repair of previously mined lands – funded by the Anglo-American Mining Company. An hotel garden: Golden Rock Inn, Nevis, West Indies, 25 acres: Within a veritable arboretum of palms and clustered with bromiliads, the relief of sand cordgrass (Spartina bakeri) gives the eye a soft landing place for a moment. A Garden of Shape and Light in Marrakesh, Morocco. An intimate courtyard fountain bordered with tile is surrounded by orange trees. This is a garden which illustrates the international nature of modern day garden design: It was designed by an Italian (Luciano Giubbilei) living in London for a New Zealand couple living in Morocco! There are many more gardens, many large but a good selection of those of a more domestic scale – I was delighted to see Rolanda Uria’s Jardin de Salvias included, a garden of less than two acres, packed with the most comprehensive and wonderful collection of salvias – it was Rolanda Uria who gave the world the widely grown and much-loved Salvia ‘Amistad’. I could go on enthusiastically but you would enjoy reading this book without too many more previews from me but I will leave you with two quotations which I enjoyed very much. When Jane Perry, Duchess of Northumberland, build the new Grand Cascade at The Alnwick Garden and reworked many areas of the garden to make them more accessible to and to be of benefit the local community she was hugely criticised – destroying an historic garden etc. etc. She responded, quietly, by putting a stone plaque at the entrance to the labyrinth which read, “Only dead fish swim with the tide”. Kevin G. Scales private garden, 2.5 acres, Quinta da Granja, Miranda do Corvo, Portugal. To the side of the house, a narrow bed contains a bevy of bananas and young Alocasia macrorrhzos ‘Borneo Giant’, a giant taro that will reach 10 feet (3 metres) tall and support leaves 5 feet (1.5metres) wide.